Dion Dublin (born 22 April 1969) is an English television presenter and former footballer. Born in Leicester and of Nigerian descent, he was capped four times for England. Dublin started his career as a centre back with Norwich City, but made his name at Cambridge United as a centre-forward. He then went on to other clubs which include Manchester United, Coventry City, Millwall, Aston Villa, Leicester City and Celtic. Dublin is also an amateur percussionist, and invented a percussion instrument called "The Dube". In 2011, he accompanied Ocean Colour Scene in a gig at the University of East Anglia, Norwich. In 2015, he joined the presenting team on the BBC One daytime show Homes Under the Hammer. Whilst at school in Leicestershire, Dublin played for several Leicestershire youth teams including Wigston Fields and Thurmaston Magpies. Dublin then went on to begin his professional footballing career with Norwich City after leaving school in 1985, but he never made a first-team appearance and was released from the club in 1988. In August 1988, he joined Cambridge United on a free transfer, as a centre-half, which had been his position at Norwich City. However, his new club recognised that Dublin had greater potential as a striker. His prolific goalscoring helped United to successive promotions. During the 1988–89 season, Dublin was then loaned out for a short spell to Barnet. The 1989–90 season saw Cambridge promoted from the Fourth Division via the play-offs, when Dublin became the first ever scorer in a Wembley play-off final. In the 1990–91 season, the club were champions of the Third Division, and the club also reached the quarter-final of the FA Cup in both seasons, with Dublin scoring at Arsenal in 1991. In the 1991–92 season, he played a big part in helping Cambridge to their highest ever finishing position in the football league, by finishing in fifth place in the last ever season of the old Second Division, but when Cambridge failed to win promotion to the top flight via the play-offs Dublin was put up for sale. He has since spoken many times of his affection for Cambridge United. Having seen Dublin in a cup tie, Manchester United manager Alex Ferguson signed him for £1 million on 7 August 1992, fighting off competition from Chelsea and Everton. Dublin was something of a surprise purchase for United, after Ferguson had tried to sign Alan Shearer from Southampton but lost out to Blackburn Rovers. He scored in United's fourth Premier League game of the 1992–93 season, a last minute winner in United's first Premier league victory – 1–0 against Southampton at The Dell. However, on 2 September, he suffered a broken leg against Crystal Palace in a 1–0 win at Old Trafford, after a tackle by Eric Young, and was out of action for six months. By the time he had recovered, however, United had signed Eric Cantona and the Frenchman was firmly established as first choice strike partner to Mark Hughes. United won the league that season for the first time since 1967, but Dublin failed to make the 10 Premier League appearances required to automatically gain a title winner's medal. However, he was given a medal as a result of special dispensation from the Premier League. In the 1993–94 season, Dublin regained his fitness, but his first team chances were restricted by partnership of Cantona and Hughes. In December 1993, Ferguson agreed a deal with Everton manager Howard Kendall, that would have seen Dublin moving to Goodison Park, but a member of Everton's board of directors, apparently feeling that Dublin was not worth the money Kendall had offered United, intervened to prevent the transfer going through – this incident led directly to Kendall's resignation as Everton manager and Dublin ended up staying at Old Trafford until the end of the season. He managed five league appearances that season, scoring once in a 3–2 home win over Oldham Athletic in early April. He also managed a further goal in the Football League Cup second round first leg, as United were beaten 2–1 by Stoke City at the Victoria Ground. The goal against Oldham was the only competitive goal that Dublin scored for United at Old Trafford. He was left out of the FA Cup winning team, and failed to make enough appearances to merit another Premier League title winners medal, and shortly after the start of the 1994–95 season, he was sold to Coventry City for £2 million. In four-and-a-half years with Coventry, Dublin established himself as one of the Premier League's top strikers and during the 1997–98 season won the first of his four England full caps. That season, he equalled the Coventry City record for most goals in a top division season with 23 goals in all competitions. Following Phil Neal's departure in 1995, the arrival of Ron Atkinson and Gordon Strachan would see Dublin fit into an attacking team in the typical Atkinson mould. It included the likes of Noel Whelan, John Salako and Darren Huckerby to add to the already attack minded Peter Ndlovu. The addition of Gary McAllister, following Euro 96, should have provided mid table stability but the teams defensive frailties often undermined Dublin's scoring at the other end. This culminated in possibly one of the greatest escapes in Premiership history in May 1997. Sitting second from bottom, Coventry City needed favourable results elsewhere whilst needing an away win at White Hart Lane. This game followed on from an away win at Anfield (Dublin scoring in the dying seconds) and a home win against Chelsea. But at Tottenham Hotspur that afternoon, Dublin scored in the first half before Paul Williams netted to secure an unlikely 2–1 win. The game reached a nerve-racking climax which included a memorable late save from City keeper Steve Ogrizovic. The following season the Sky Blues improved at home and enjoyed a season of mid table security. Dublin formed an impressive partnership with Darren Huckerby which not only produced some memorable goals but also propelled the Sky Blues to the FA Cup Sixth Round against Sheffield United; a game they narrowly lost in a penalty shoot out. The 1997–98 season also saw Dublin share elite status as the Premier League's top scorer with Blackburn's Chris Sutton and Liverpool's Michael Owen – each Englishman scoring 18 league goals. During this season, Blackburn manager Roy Hodgson tabled a bid which Dublin rejected. He remained at Highfield Road and contributed to Coventry's best finish to date in the Premiership (11th). Dublin was controversially excluded from the England 1998 FIFA World Cup squad, despite being the Premier League's joint top-scorer in the 1997–98 season, alongside Michael Owen and Chris Sutton. However, his exploits at club level were still attracting significant attention and in the autumn of 1998, he chose to move to Aston Villa for £5.75 million. In his first four games for the club, he would score 7 goals including a memorable hat-trick against Southampton in only his second game for the Villans. As a result, he is one of only six players to score in the first four consecutive games for a Premier League club. In December 1999, whilst playing for Aston Villa against Sheffield Wednesday, he sustained a life-threatening broken neck, as a result of which he permanently has a titanium plate holding three neck vertebrae together. Just days before suffering this injury, it was reported in the News of the World that Dublin would soon be sold by Aston Villa for a fee of around £6million as the club looked to finance a fall in its share value as a result of manager John Gregory's heavy expenditure on players. Incredibly, the injury did not end Dublin's career and he was back in action three months later. In April 2000, a week after returning to the team, he helped Aston Villa reach their first FA Cup final in 43 years, which they lost 1–0 against Chelsea, scoring a penalty in the semi-final shoot-out against Bolton Wanderers. Having regained his fitness, Dublin remained on the Villa Park payroll until 2002. Faced with competition for a first team place by Juan Pablo Ángel and Peter Crouch, Dublin spent several weeks on loan at First Division Millwall. In his time there, he scored two goals, against Stockport County, and Grimsby Town in five league matches to help them into the play-offs where despite Dublin's goal in the first leg of the semi final, Millwall lost to Birmingham City 2–1 on aggregate. Returning to Villa, he found himself again a first choice striker, partnering Darius Vassell up front. Dublin was sent off at Villa Park for a headbutt on Robbie Savage in the Birmingham derby match, which ended 2–0 to Birmingham City. When his contract expired in the summer of 2004, he was given a free transfer. He was signed by Leicester City, who had been relegated from the Premier League to the Championship. In his first season with the club, he scored only four goals in 38 competitive matches. During the 2005–06 season, Dublin lost his place as the team's main striker, but continued to appear as a defender. His contract at Leicester City was terminated by mutual consent on 30 January 2006. He was snapped up quickly by then Celtic manager Gordon Strachan, to cover for the loss of Chris Sutton, on a contract until the end of the season. At Celtic, Dublin achieved double success, with Scottish League Cup and Scottish Premier League winner's medals. On 19 March 2006, Dublin came on as a sub and scored the final goal as Celtic defeated Dunfermline 3–0 to win the Scottish League Cup final, and also played enough matches with Celtic to merit a title medal. In the league, he made three league starts and eight substitute appearances for Celtic, scoring once against Kilmarnock on 9 April 2006 in a 4–1 win at Rugby Park. Despite one or two decent performances for the Parkhead outfit, Dublin was released by manager Gordon Strachan in May 2006. Dublin battling in the air against Tom Kemp in the FA Cup game with Tamworth. On 20 September 2006, Norwich City announced that Dublin had joined them until the end of the 2006–07 season. It marked a return, almost 20 years after leaving, for Dublin to the club where he began his career. He made his debut on 23 September 2006 when he came on as substitute against Plymouth Argyle. He scored his first competitive goal in Norwich City colours in a 3–3 draw against Queens Park Rangers on 14 October 2006 at Loftus Road. Steve Wilson cited Dublin as the main inspiration behind Norwich's 4–1 FA Cup 3rd Round win at Tamworth, in which the striker scored two goals and set up numerous chances for other teammates. Dublin was an important figure in Norwich securing safety from relegation to League One and the supporters recognised his contribution by voting him in second place in the Norwich City player of the year award, and on 23 May 2007 he ended speculation about his future by signing a new one-year contract at Norwich, keeping him at the club until the end of the 2007–08 season. On 2 September 2007, Dublin, whilst a pundit on the Aston Villa v Chelsea game, said that this season would be his last as a footballer, citing the fact that his 'bones have started to talk to him' as the reason, meaning that he did not think his body can handle another season. "It was incredible at Hillsborough. If you think of the stadia I could've retired at, away from Norwich of course, with the history and the feeling, then Sheffield Wednesday was the perfect place". In the spring of 2008, Dublin was approached by Jimmy Quinn, then manager of Cambridge United, about joining his old club for the 2008–09 season. However, the player would not change his mind about retiring. He was voted the club's Player of the Year and awarded the Barry Butler trophy on 26 April 2008 in his final season as a footballer, at his penultimate game, and on his final appearance at Carrow Road. 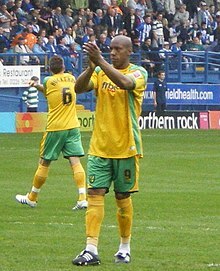 Dublin played his final game on 4 May 2008, featuring in Norwich's 4–1 loss to Sheffield Wednesday in front of 36,208 fans at Hillsborough – the highest Championship attendance that season. When he was taken off in the 66th minute, Dublin received a standing ovation from both sets of supporters, players and referee Mark Clattenburg. Dublin earned his first cap for England on 11 February 1998, playing the whole 90 minutes in the 2–0 friendly defeat to Chile at Wembley Stadium. In the run-up to the 1998 FIFA World Cup, Dublin played in the King Hassan II International Cup Tournament in May, starting in the 1–0 win against Morocco, and coming off the bench in 0–0 draw with Belgium, a game England lost on penalties. Despite showing good form and versatility throughout the season, including finishing joint top scorer in the Premier League with 18 goals, Glenn Hoddle included Les Ferdinand ahead of Dublin in his 22-man squad for the tournament in France. On 18 November, he started in the 2–0 friendly win against the Czech Republic at Wembley Stadium. This turned out to be Dublin's last cap for his country. He won a total of 4 caps for England but didn't manage to score any goals. Since retiring from football, Dublin has worked in the media as a pundit for Sky Sports. As well as appearing on Ford Super Sunday with Richard Keys, Dublin has commentated on a number of games including the UEFA Champions League games with Martin Tyler. He has also been a member of the panel on BBC Radio 5 Live's Fighting Talk. He has also co-presented 606 on BBC Radio 5 Live, Match of the Day 2 and was also a regular on BBC One's Late Kick Off in the East region. He joined Lucy Alexander and Martin Roberts on Homes Under the Hammer in 2015. Away from football, during his spell with Norwich, he invented a percussion instrument called The Dube, a form of cajón. In 2011, he accompanied Ocean Colour Scene during a gig at the University of East Anglia. ^ "Dion Dublin". Barry Hugman's Footballers. Retrieved 7 March 2017. ^ "Dublin urges football hopefuls to listen and learn". 11 June 2011. ^ Gardner, John (28 October 1998). "I'm not Dublin your money; Roy won't give Dion any special wage deal". Daily Record. The Free Library. Retrieved 29 March 2012. ^ a b Adam Ellis (9 March 2016). "Where Are They Now? Cambridge United's Div 3 Champions 1990/91". The League Paper. Retrieved 29 May 2018. ^ Metcalf, Rupert (7 August 1992). "Football: United sign pounds 1m Dublin". The Independent. London. Retrieved 1 May 2010. ^ Slot, Owen (25 August 1992). "Dublin delivers perfect finish for United". The Independent. Retrieved 29 March 2012. ^ Allsop, Derick (3 September 1992). "Dublin facing five months out with broken leg". The Independent. Retrieved 29 March 2012. ^ "Dion Dublin Q & A". Daily Mirror. 10 March 1997. Retrieved 29 March 2012. ^ Lovejoy, Joe (5 April 1994). "United stay clear of rampant Rovers: Ince relieves fraying Old Trafford nerves – Dalglish's men keep up the pressure as Oldham and Everton drop closer to relegation". The Independent. Retrieved 29 March 2012. ^ Burton, Mark (10 September 1994). "Dublin moves to Coventry". The Independent. Retrieved 29 March 2012. ^ "No Headline Present". HeraldScotland. ^ "Dublin becomes a Villan". BBC Sport. 5 November 1998. Retrieved 29 March 2012. ^ "Coyle happy to take a loan". Bolton News. 4 March 2011. Retrieved 4 March 2011. ^ Curtis, John (21 December 1999). "Dublin's neck injury could have left him crippled". The Independent. Retrieved 29 March 2012. ^ "Flown From the Nest – Dion Dublin". www.ex-canaries.co.uk. ^ "Chelsea claim FA Cup glory". BBC Sport. 20 May 2000. Retrieved 29 March 2012. ^ "Villa book Cup final place". BBC Sport. 2 April 2000. Retrieved 29 March 2012. ^ "Millwall 3–0 Stockport". BBC. 30 March 2002. Retrieved 15 September 2009. ^ "Lions see off Mariners". BBC. 21 April 2002. Retrieved 15 September 2009. ^ "Bruce salutes Dublin". BBC. 28 April 2002. Retrieved 15 September 2009. ^ "Birmingham steal win". BBC. 2 May 2002. Retrieved 15 September 2009. ^ "Leicester seal Dublin deal". BBC Sport. 12 June 2004. Retrieved 19 February 2010. ^ "Veteran Dublin signs for Celtic". BBC Sport. 30 January 2006. Retrieved 29 March 2012. ^ "Football Fixtures & Results – Updated Match Odds – Soccer Base". www.soccerbase.com. ^ "Kilmarnock 1–4 Celtic". BBC. 9 April 2006. Retrieved 15 September 2009. ^ a b Sheffield Wednesday vs Wigan Athletic. Wednesday – match programme. 2 August 2008. p. 43. ^ "Salas sinks England". BBC Sport. 11 February 1998. Retrieved 11 September 2012. ^ "Morocco 0–1 England". EnglandStats.com. England International Database. 27 May 1998. Retrieved 11 September 2013. ^ "England 0–1 Belgium". EnglandStats.com. England International Database. 29 May 1998. Retrieved 11 September 2013. ^ "Gazza axed and flies home". BBC Sport. 1 June 1998. Retrieved 11 September 2012. ^ "England 2–0 Czech Republic". EnglandStats.com. England International Database. 18 November 1998. Retrieved 11 September 2013. ^ a b "Dion Dublin". EnglandStats.com. England International Database. 11 September 2013. Retrieved 11 September 2013. ^ "Dion Dublin joins BBC One Daytime show Homes Under The Hammer – Media Centre". BBC. ^ a b "Dublin reveals musical side". BBC News. 28 February 2011. ^ "Ex-Manchester Utd footballer Dion Dublin launches new musical instrument". NME. 28 January 2010. Retrieved 29 January 2010. ^ "VIDEO: Dion Dublin plays The Dube with Ocean Colour Scene". ^ a b c "Dion Dublin: Overview". Premier League. Retrieved 16 April 2018. ^ "Angel carries Villa home". Telegraph. 21 August 2001. Retrieved 12 September 2018. ^ Grahame, Ewing (30 March 2008). "The teams Gordon Strachan built at Celtic". ISSN 0307-1235. Retrieved 4 June 2018. ^ "Dunfermline 0-3 Celtic". 19 March 2006. Retrieved 4 June 2018. ^ "Coventry City | Club | History | History | Hall of Fame". 22 July 2012. Archived from the original on 22 July 2012. Retrieved 22 August 2015.